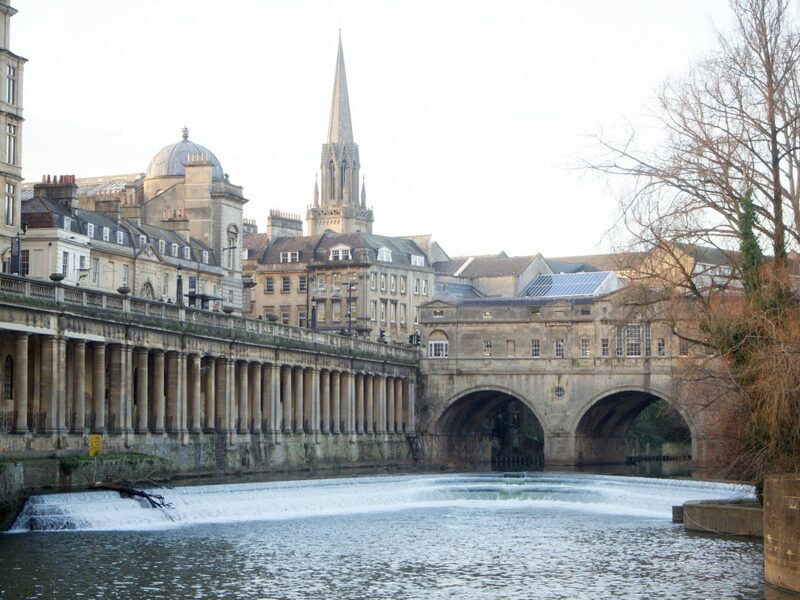 If you think of the city of Bath, what comes into your head first? The Roman Baths yes? Well that was exactly what we thought of, and were excited to be able to experience the roof top thermal baths that we had heard about. I loved the idea of being in the hot thermal water, perhaps sipping a glass of bubbles, while the chill of the January air gave us a bite whenever your shoulders were above the waters surface. 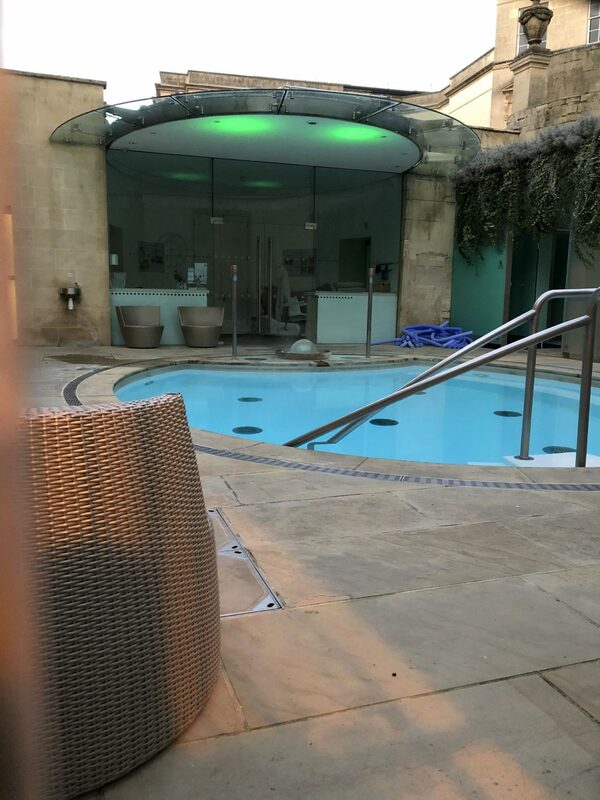 Well, that particular little experience has remained but a dream, as, typical of our luck, the roof top thermal spa pool was closed for refurbishment the exact week we were there……. Here is the things we did instead (stamps off in a huff, still not quite over the fact)…….. I will give you the run down on what we did while in Bath. 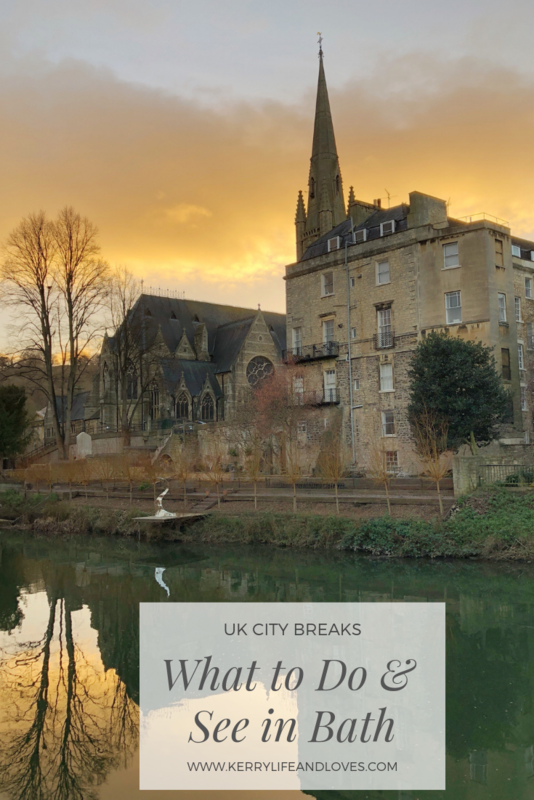 Iv already covered the details of where we stayed, ate etc in this post, Where to Stay, Eat, Drink on a mini break to Bath, so this post will be more about the things to do and see. I hope you find it useful if you are planning on heading there yourselves. Its worth noting that in early January, when we went, a few of the things you may want to visit have a little winter shutdown. As I already mentioned, the rooftop thermal baths were closed, as was the Royal Crescent Museum and some restaurants. 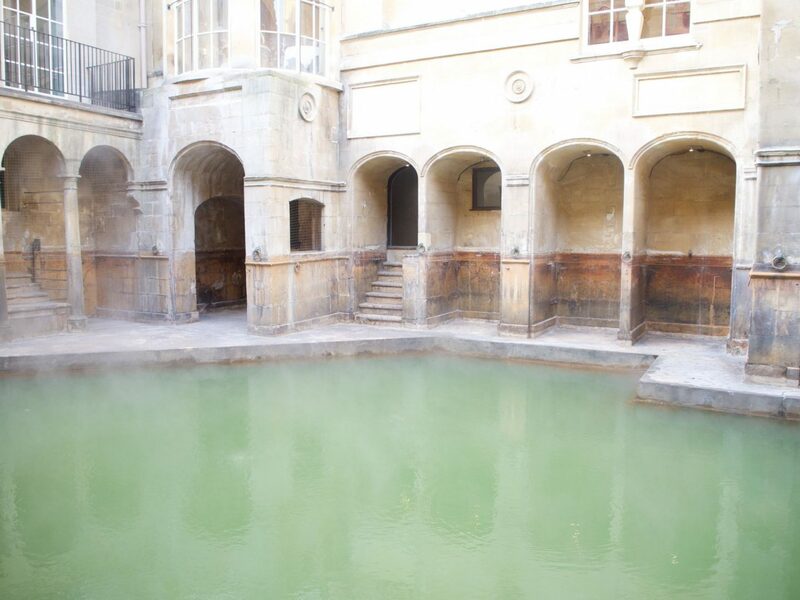 Baths natural hot springs, the only ones in Britain, have attracted people to the city for thousands of years. 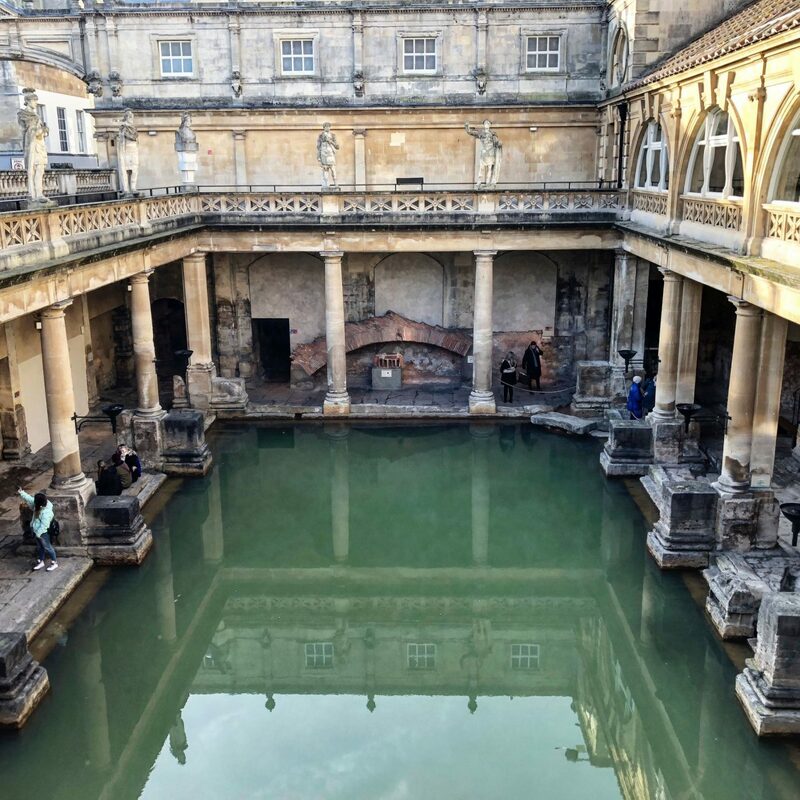 Although the springs were worshipped by people long before the Romans came into town, it was the Romans that built Bath’s famous bathing pools. The continuous flow of the natural hot water still fills the baths, and you can see the steam rising off the baths, indicating its warmth. You can also try a cup of the water from the fountain in The Pump Room. Its an acquired taste I feel…. Now green in colour, the baths dont particually tempt to me in for a dip, but walking around the baths you really do get a feel of how they were viewed and used many years before. I almost felt compelled to whack a toga on. Its such an interesting place and I would say its a must see on a visit to Bath. It will cost you around £18 for an adult ticket, but there are various discounts and package bundles available for booking in advance and online. You can see costs here. Ohhhhh beautiful Bath Abbey. Its a stunning building with its Gothic architecture and brightly coloured stained glass. I loved it in there. Free to enter, (but donations welcome) you can wander round the Abbey and marvel in its beauty. Some fun historical facts for you; The 15th century church standing now, is the third place of worship to stand on the grounds since 757AD. 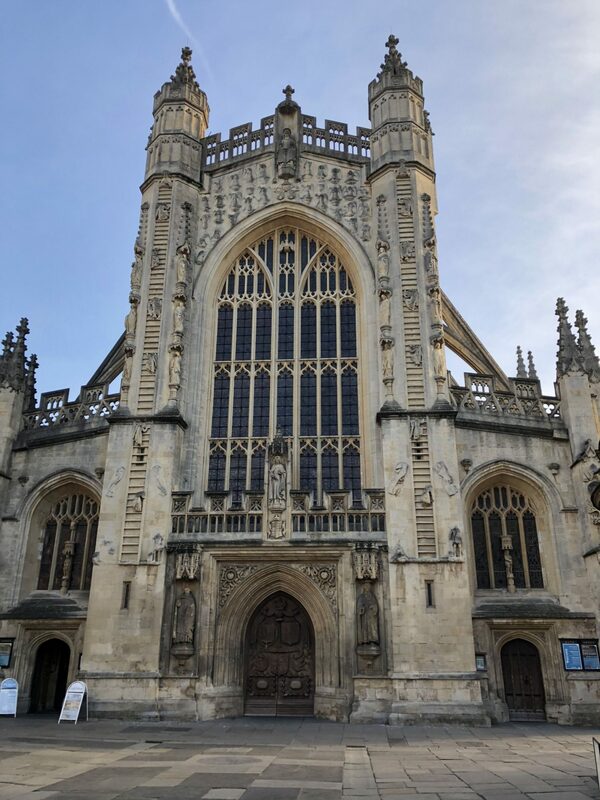 The front of the Abbey has the famous “Ladders of Angels’ on it, inspired by the Bishop of Bath’s dream of Angels going u to heaven. In 973, the first King of England, King Edgar, was crowned on the site. 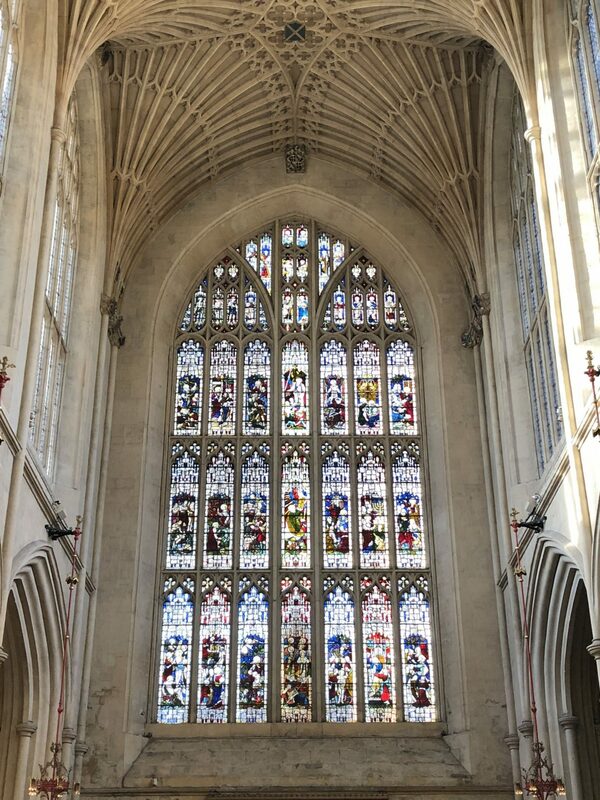 There is so much history at the Abbey, its another must see in Bath. The famous author of Pride and Prejudice, resided in Bath for around 6 years. It is said to have inspired her book Persuasion. The Jane Austen centre, with its staff dressed in regency costume, is a small but full, museum dedicated to all things Jane, and as an aspiring, frustrated author, I felt I had to visit. If you book online, the ticket to gain entrance will be £11, (full details here). In truth, I think it would only be worth it to fans of Jane Austen work as it isn’t a huge place. 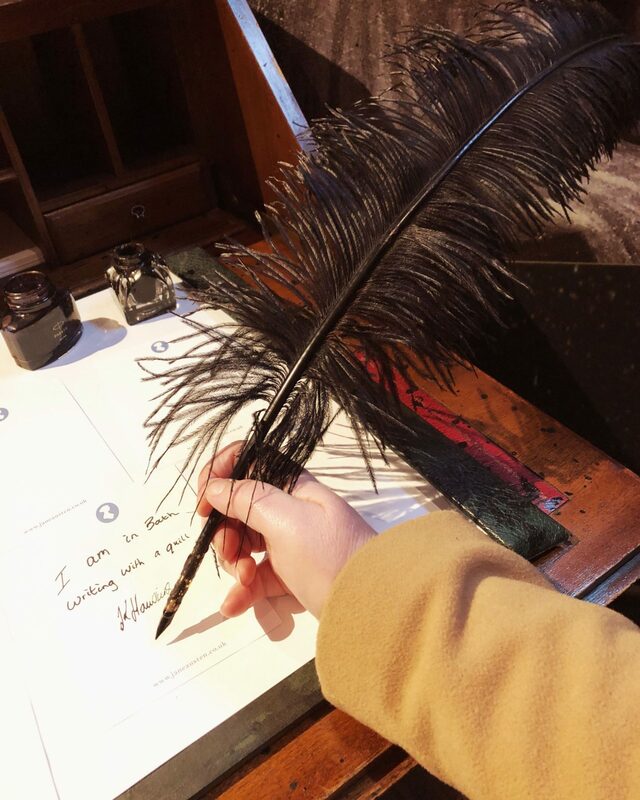 I loved it as I love Jane Austen’s books, (Emma is my favourite, just incase your wondering) and I was living my best life when we got to write with a real quill and ink well! The centre gives you great insight into Jane’s life, and I found intersting items to look at, including letters from Jane to her much loved sister. A must for any Austen fans. 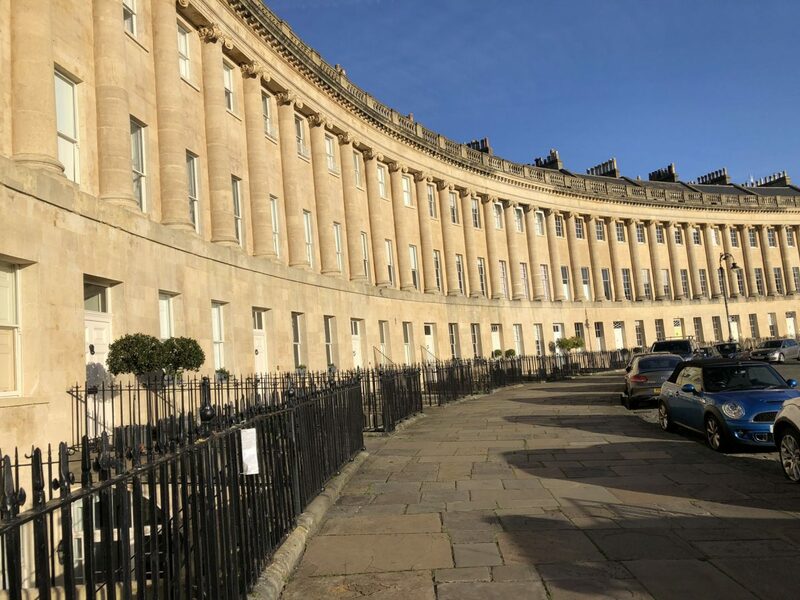 You cannot go to Bath without going to see the gorgeous Royal Crescent. The most famous road in Bath is just picture perfect, with its honey hued buildings and perfect crescent shape. I loved walking along it, and the Royal Crescent Hotel and Spa in VERY much on my list of places to stay. The crescent of 30 town houses, overlook the Royal Victoria park, and were built between 1767 and 1775. The road is mostly private homes, except for the hotel, and the crescent museum (this was closed while we were there), that is situated in number 1 Royal Crescent. You have to go to see the Crescent, it really does fire the imagination of Bath’s high society of the time. It also has the most gorgeous little shops a 2 minute walk away, where I discovered the most amazing crystal shop…. Im not going to lie, when I first saw this bridge crossing the River Avon, I was a little underwhelmed. I imagined that it was like the Charles Bridge in Prague, so I expected it to be a lot bigger. It is gorgeous, I will give it that, and as one of only 4 bridges in the world that has shops spanning it on both sides, architecturally it is very interesting. I just thought it was small. 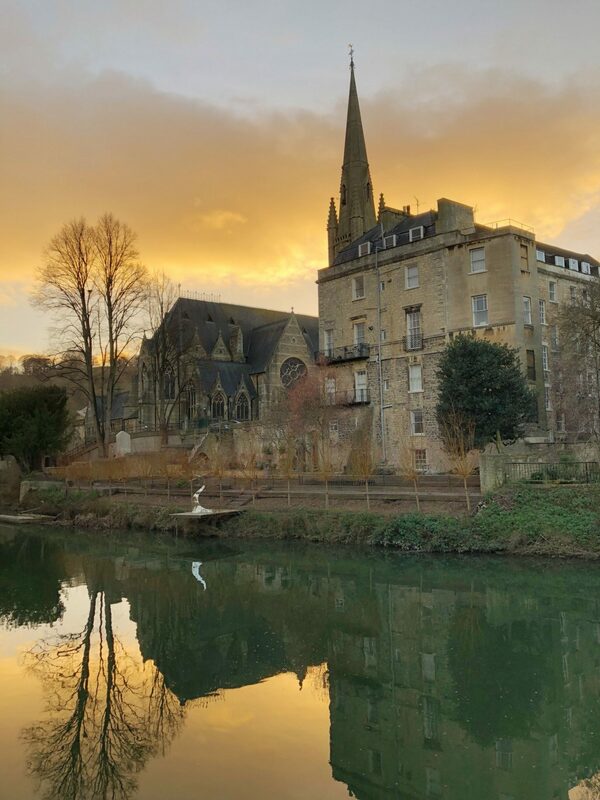 It is a stunning backdrop to the city, and looking back towards the bridge from the riverside path, the view of it and Bath is beautiful. You have to go and see the bridge, but my top tip, go around sunset time and walk along the river path. The sunset over Bath is just beautiful. The last couple of things I am going to mention in Bath, is the Bartlett Street Quarter. This is a little shopping area that we stumbled across, but is packed full of little independent shops, cafes and restaurants. We loved it. It has a real “arty” feel to it, and we loved browsing in all the little shops. It is definitely worth grabbing a coffee in one of the cafe’s and doing a little people watching. You also have the wonderful Theatre Royal that is a fabulous way to spend an evening. The historic, quaint little theatre, built in 1805 and seating just 900, is a Georgian building, showing plays throughout the year. I would have loved to have gone and experienced a play here, but we ran out of time. So, there we have it! My little low down on a short break in Bath. What do you think? Anything that appeals to you? Have you visited any of them? Let me know! "Vegan Menu Launches at Lebanese restaurant Chain"
Ha ha! It was rather special. Yes it is. I adore Bath! Great post! I visited Bath many years ago, and I remember being so sad that the Abbey windows were being repaired… It just wasn’t as cool without them. Hopefully I can visit again in the future! Thank you so much for stopping by Jenna. The Abbey windows are strikingly beautiful. They apparently tell a story too, but I couldnt follow it! I hope you get to go back, we plan to have a re-visit too.